• High Blood Pressure can often be alleviated or eliminated completely by weight loss surgery. • High Cholesterol can be alleviated or eliminated in 80% of patients in as little as 2-3 months post- operatively. • Heart Disease in obese individuals is more common than heart disease in persons who are of average weight and adhere to a strict diet and exercise. There is no hard and fast statistical data to definitively prove that weight loss surgery reduces risk of heart disease; however, if we can significantly reduce many of the co-morbidities that we experience as obese individuals, then the risk of heart disease is likewise reduced. • Diabetes Mellitus can often be eliminated or significantly improved. This gives patients control of its complications, as the problems associated with diabetes will be arrested in their progression and blood sugar will be maintained at normal levels. • Abnormal Glucose Tolerance, or Borderline Diabetes is even more likely to be reversed by the sleeve gastrectomy or Lap Band surgery. Since this condition becomes diabetes in many cases, the operation can frequently prevent diabetes. • Asthma sufferers may find that they have fewer and less severe attacks. Some patients postoperatively show no asthma symptoms at all. • Sleep Apnea Syndrome sufferers can receive dramatic benefits and many find their symptoms completely gone within a year of surgery. Some even stop snoring completely! • Uterine Cancer has long been linked to obesity. Having more fat tissue can increase a woman’s estrogen levels, which increases her uterine cancer risk. Therefore, surgery can help reduce the risk of uterine cancer. 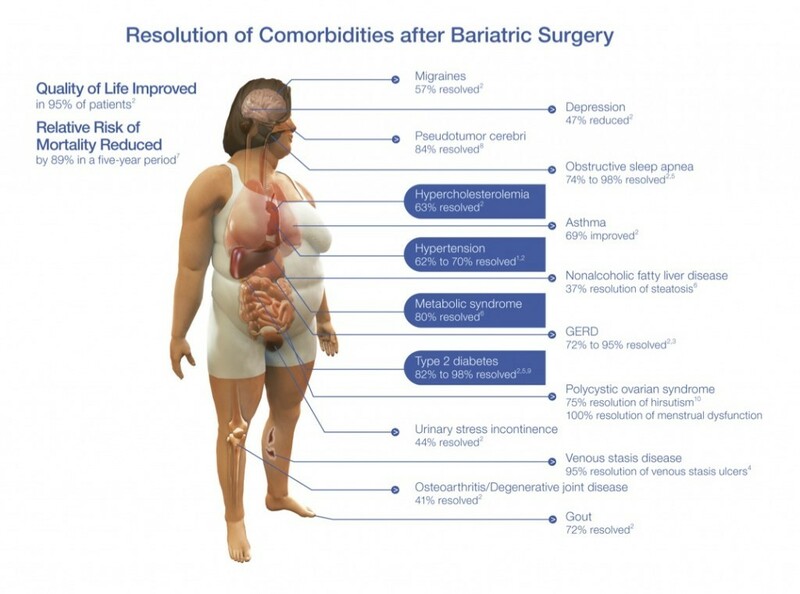 • Infertility can often be improved with bariatric surgery due to weight loss and the return of normal hormonal levels. • Gastroesophageal Reflux Disease patients’ suffering can be greatly relieved within as little as a few days of surgery. • Stress Urinary Incontinence responds dramatically to weight loss, usually becoming completely controlled. A person who is still troubled by incontinence can choose to have specific corrective surgery later, with much greater chance of a successful outcome with a reduced body weight. • Lower Back Pain and Degenerative Disk Disease and Degenerative Joint Disease can be considerably relieved with weight loss. Greater comfort may be experienced even after as few as 25 lost pounds. More than 12.5 million Americans are MORBIDLY OBESE and this can be a matter of life and death. We understand you have tried different diets, medications and weight-loss services for years without long-term success. That is why we are here to hold your hand through the process of helping you become a healthier, more active, and more confident person due to long-term weight loss.